Design Nature is a 1st semester freshman class that's our first exposure to the "do-learn" concept. It's a course primarily focused on teaching us how to design and build to certain specifications. We had two major projects that helped us develop our individual and collaborative skills. 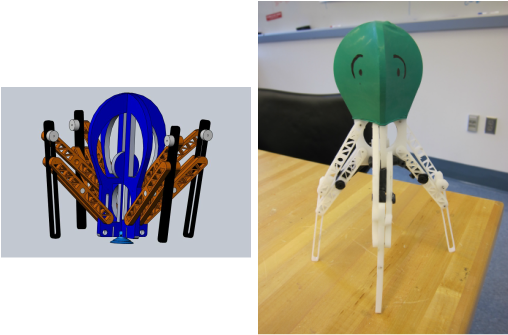 On the left is the final CAD model in Solidworks and on the right is the physical model. 3 joules of stored energy, jumped to a substantial height/distance and had to have a delayed launch, as in it could not jump just as it was released by the operator. I went through the process of designing prototypes starting with sketches, progressing to sketch models, and two laser-cut Delrin prototypes. afford to give him 4 legs and therefore he was named"Mr. Quadipus." He had four pieces of surgical tubing that were stretched roughly 2 cm and attached to his body and legs. Additionally, there was a suction cup on the bottom to ensure a delay in the launch. Description:To construct a toy based on biomimicry that could transport objects. This was our first team project in the Design Nature class. As the unofficial project manager I convinced my team to support certain designs and kept us on schedule. I also sought out and found faculty support for our project since none of the professors teaching our class had ever built anything that flew. My team was the only team to make a flying toy based on the natural flight of birds. These toys are known as ornithopters. 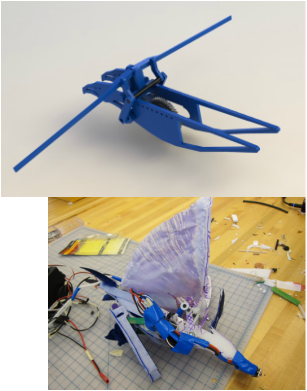 Due to our constrained budget and the difficulty of making an aerodynamic toy, we decided that instead of making a remote-controlled bird that could fly around a room, we instead would make a remote controlled bird that would be tethered to a specific point in the ceiling. Our phoenix was powered by a servo that was attached to a series of other gears in order to reduce the speed but increase the amount of torque necessary to overcome the friction in our plastic linkages. These linkages were attached to one of the gears such that it would act like a cam system in which with every rotation of the gear, the wing would be pulled down and then pushed back up. As a toy, we made felt balls that kids had to throw at the velcro attached to the feet and body of the ornithopter.